MUKALLA, Yemen (AP) — Hundreds of men swept up in the hunt for al-Qaida militants have disappeared into a secret network of prisons in southern Yemen where abuse is routine and torture extreme — including the “grill,” in which the victim is tied to a spit like a roast and spun in a circle of fire, an Associated Press investigation has found.Senior American defense officials acknowledged Wednesday that U.S. forces have been involved in interrogations of detainees in Yemen but denied any participation in or knowledge of human rights abuses. At one main detention complex at Riyan airport in the southern city of Mukalla, former inmates described being crammed into shipping containers smeared with feces and blindfolded for weeks on end. They said they were beaten, trussed up on the “grill,” and sexually assaulted. According to a member of the Hadramawt Elite, a Yemeni security force set up by the UAE, American forces were at times only yards away. Now I know whose ships the captured AQAP militants are being ferried to from Al Mukalla, Hadhramaut. A Yemeni officer who said he was deployed for a time on a ship off the coast said he saw at least two detainees brought to the vessel for questioning. The detainees were taken below deck, where he was told American “polygraph experts” and “psychological experts” conducted interrogations. Two senior Yemen officials, one in Hadi’s Interior Ministry and another in the 1st Military District, based in Hadramawt province where Mukalla is located, also said Americans were conducting interrogations at sea, as did a former senior security official in Hadramawt. Former detainees and one Yemen official provided the AP with the names of five suspects held at black sites who were interrogated by Americans. The UAE had been part of the CIA’s “black sites” torture apparatus. Its agents are thereby well trained. 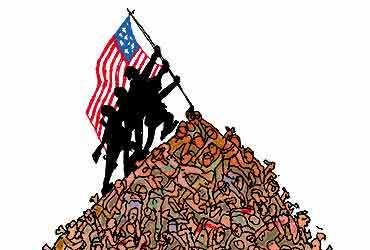 The U.S. military and/or the CIA now seem to have outsourced (vid) most of the “dirty” stuff to them. That does not make them less culpable. The Obama administration has called this acting “by, with and through” allies. The Trump administration continues with the scheme. The tortured “militants” were most likely not al-Qaeda chaps. Al-Qaeda in the Arab Peninsula held the harbor city of Mukalla in Yemen. The UAE “liberated” the city in April 2016 by making a deal with AQAP and letting them go. It is allied with the group while fighting the Yemeni Houthi. If the U.S. torture crews believe that they are “interrogating” real “al-Qaeda” they are hoodwinked by the UAE operators. The U.S. military is, of course, denying all torture accusations and the CIA is, of course, not commenting, but denigrating the accusers. We have heard such denials before. 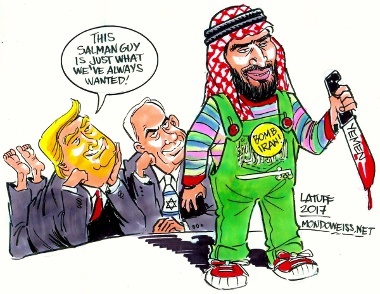 Yesterday an al-Saud family clown prince replaced another al-Saud family clown prince to replace the old al-Saud family king who will be offed soon. This in a country named after the al-Saud family. It is change you can believe in. The soon to be dictator-king Muhammad bin Salman bin Abdulaziz Al Saud, the guy who has debt-to-GDP, is fawned over in U.S. media. That is no wonder. He has lot of money and no idea of its value. He paid €500 million for a used ship that had cost only €300 million when it was build six years earlier. Some of his money will drop here or there when a journalist writes a pretty piece about him. If the journo is really good at it s/he will get paid off in some CIA endorsed weapon deal with the Gulf sheiks. Bin Salman is not very bright. He visited Israel and is in constant contact with Israeli officials. His development program for Saudi Arabia, based on austerity, was written by McKinsey consultants and is thereby likely to fail. With his extreme anti-Iranian stand he looks like a mere U.S.-Israeli puppet. The 26 million people he rules over will not like either. Many Arab peninsula citizens will want to see his head on a pike. The House of Saud is now a house of cards destined to fall. The rise and installation of Muhammad bin Salman as Saudi King is, in part, a project of his mentor, the Emirati clown prince Mohammed bin Zayed. Bin Zayed rules the UAE. “By, with and through” allies comes to mind. The Saudi rulers sponsored, together with Qatar, the ISIS takeover of Iraq and parts of Syria. They also helped finance the Clinton campaign. The Islamic State terrorists just blew up the 845 year old al-Nuri mosque in Mosul. ISIS leader Baghdadi had declared himself Caliph in that mosque and the Iraqi military was on the verge of re-taking it. Almost from the beginning of its rule, the Islamic State systematically destroyed or damaged one important monument or shrine after another[…] In Mosul’s library, militants burned thousands of old books and manuscripts. Demanding single-payer health care is obviously comparable to the sectarian massacring of thousands or to blowing up century old places of worship. Only “militants” do such. But don’t you dare to compare Saudi sponsoring of ISIS and of Hillary Clinton. Even when the Saudis are doing both. Drawing connections from the UAE/CIA torture in Yemen, the UAE mentoring of the coming Saudi king, Saudi sponsoring of the CIA endorsed Clinton campaign, the U.S./Saudi caused famine, as well as the terror of ISIS in not kosher – even when there are direct lines between all of these. Trump is, by the way, no better than Clinton in this. His endorsement of the aggressive new Saudi ruler while a U.S. jet shoots down a Syrian plane which is attacking ISIS is likely not just a coincidence. But its the progressives who are “militant”.